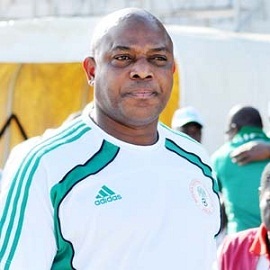 Stephen Keshi has announced he is stepping down as the Nigeria coach following the World Cup defeat to France, while defender Joseph Yobo has retired from international football. The Super Eagles pushed France hard in their last-16 match in Brasilia only for Paul Pogba's late header and a last-gasp own-goal by Yobo to seal a 2-0 win for Les Bleus. It appears that will be Nigeria's final match under Keshi, who said: "It's time for me to go back to my family and face fresh challenges." The 52-year-old, who took over in 2011, has been linked with the South Africa job. Keshi has resigned his post once before, a day after winning last year's African Nations Cup, but was persuaded to stay on. The Former Everton defender Yobo is also on his way out. He became the first Nigerian to win 100 caps during the France game and confirmed soon afterwards he would not be continuing on the international stage. "This is it. I can look back on my career with great pride," he told BBC Sport. "I wanted to leave on a high for my country. Defeat by France was not the right way to go but I'm happy with all I've done for the national team. "It's time to give a chance to other people to come through. Our football has a bright future and I am confident this team can achieve success sooner rather than later."